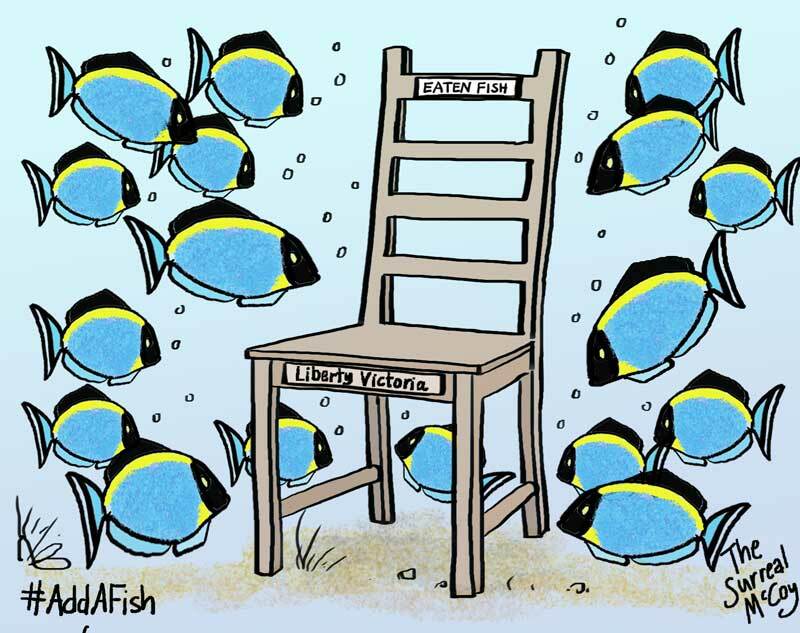 Manus Island detainee and current CRNI Courage in Editorial Cartooning laureate Eaten Fish has received the Voltaire Empty Chair Award at Liberty Victoria‘s annual event celebrating free speech advocates. Eaten Fish’s staunchest allies, poet and human rights activist Janet Galbraith and cartoonist Andrew Marlton (aka First Dog on the Moon) attended on Eaten Fish’s behalf. Marlton read a message of goodwill and thanks from the young Iranian, still facing an uncertain future even as Australia’s facility in Papua New Guinea is dismantled. The British Professional Cartoonists’ Organisation continue in their fantastic efforts to raise the profile of Eaten Fish’s case, exhibiting cartoons from their #AddAFish campaign at next month’s cartoon festival in Herne Bay, Kent. One of the PCO’s leading committee Carol Issacs (aka The Surreal McCoy) created a cartoon especially for last night’s ceremony in Victoria.